Get A Grip – The Gun Room Inc.
One thing that is constantly overlooked in the pistol shooting world is the grip. People who shoot a lot know that a good grip can make or break your patterning down range. Pistols that seem too big or too small for shooter’s hands can usually be fixed with a good set of grips. Wood, polymer, shock absorbing rubber materials, etc. today’s pistol grip has come a long way from grandpa’s stag jewelry. 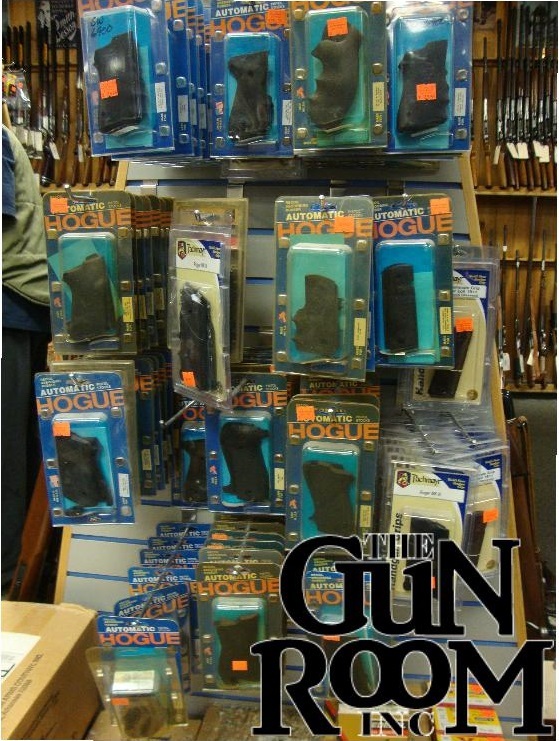 The Gun Room Inc. carries Pachmayr, Hogue, and custom grips to fit everything from a 1911 to a Smith & Wesson frame from long ago. Get a grip and put your rounds on target accurately and comfortably by stopping in to The Gun Room Inc. and asking one of the geezer squad about grips.